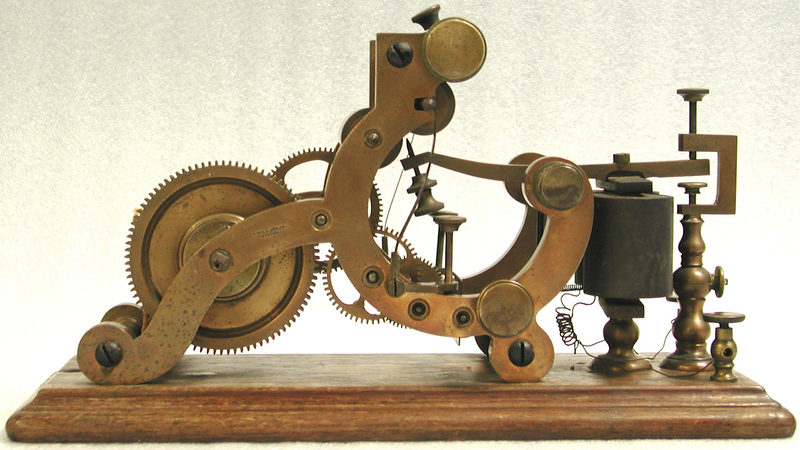 A telegraph register made in 1870. Telegraph registers are electrically-activated printers that receive Morse code messages. The message travels as a series of electrical pulses through a wire. The pulses energize the register’s electromagnets which move a lever-arm holding a pen or stylus. A clockwork mechanism pulls a strip of paper across the pen or stylus, recording the message. Short pulses draw or emboss a dot, slightly longer pulses a dash. The sequence of dots and dashes represent letters and numbers. “Telegraph Register,” Digital Public Library of America, http://dp.la/item/59d4a93458149215ba76b51f95de7619. A Congressional tribute from 1999 to Mr. Antonio Meucci, one of the inventors of the telephone. An experimental telephone made by Alexander Graham Bell, 1876. Alexander Graham Bell's “large box” telephone, 1876. Alexander Graham Bell's telephone patent drawing and oath, officially approved March 7, 1876. An excerpt from The History of the Telephone by Herbert Casson about Alexander Graham Bell’s breakthrough experiment, 1910. A photograph of Alexander Graham Bell during his demonstration of the telephone for Joseph Henry's Family, January 13, 1877. A diagram of Alexander Graham Bell’s speaking telephone, patented March 19, 1878. A photograph of Thomas Edison’s parlor phonograph, which was used for experimentation by Alexander Graham Bell, 1879. A photograph of Alexander Graham Bell in New York calling Chicago on the telephone, 1892. A photograph of the first telephone office in the town of McGraw, New York, 1902. A photograph of operators working the switchboard at the Utah Independent Telephone Company, 1905. A photograph of Alexander Graham Bell and others at the opening of the first transcontinental telephone line, New York, January 25, 1915. A photograph of workers in the Orange Central Office of the Pacific Telephone & Telegraph Company, Orange, California, 1915.